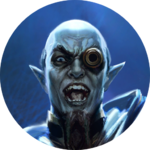 Mecinar is a former Clockwork Apostle who was cast out of the Clockwork City for experiments involving merging his fellow Acolytes with various beasts, turning them into what Sotha Sil considered abominations. He seeks to absorb the power of the Mechanical Heart, created by Sotha Sil as a mechanical replication of the Heart of Lorkhan, and turn himself into a god. "Excellent. I have learned much." "Grant me your wisdom, master." "You will respect my genius." "My intellect is sharper than that." "You're too kind, master. It will be the death of you." "Forgive me if I've overstepped my bounds." "You've not seen the last of me!" Mecinar first appears as a character referred to as the Mysterious Figure before the heroes uncover who he really is. Swims-at-Night: "I guess the poison isn't the only thing that makes this place dangerous." Swims-at-Night: "The… ring … is ours!" Mysterious Figure: "I'm afraid not. Thank you for leading us to it though." Laaneth: "Yes, this is the place — I can see the contours of the enchantment. But it's going to take tremendous power to break it. Perhaps the machinery here can help." Swims-at-Night: "Whatever you're going to do, do it fast; the defenses are stirring." Mysterious Figure: "At last! Once again you have led me to my quarry. My old master ensured I could never break those seals." Mecinar: "Thankfully you have done it for me!" Laaneth: "It's Mecinar — the apprentice from Sotha Sil's memories!" Mecinar: "Yes. And it's about time you witnessed my true power!" Mecinar: "For centuries I have prepared for this moment, crafting myself into a tool that could absorb this power. Now at last, godhood is mine!" Mecinar: "And your services are no longer required!" Laaneth: "It's the people of the city. The machines are… remaking them. We have to stop this." Galyn: "Thank you. Mecinar is rebuilding the city in his image. More of our people were taken as well. We must stop him." Mecinar: "You outlanders cannot be allowed to interfere with my experiments. Fabricants, deactivate the intruders." Mecinar: "I thought you might come. I've prepared a surprise for you. For years I have modified the living. But with my newfound power, I've found the dead just as malleable." Swims-at-Night or Laaneth: "Mecinar's will must be obeyed. Prepare to be destroyed." Laaneth: "Mecinar must answer for this… this abomination! It's time to finish this!" Mecinar: "Come then, and meet your doom. Swims-at-Night: "MECINAR! You'll pay for what you've done to her!" Galyn: "Now, use the tools to harness the Heart's power! Fight Mecinar as a fellow god!" Laaneth: "No — I can feel the Heart's energy. It's too unstable. There's every chance you'll be overwhelmed. And if you fall, Mecinar will still have his power." Galyn: "Those are the risks we have to take. Without the Heart, my people will die!" Laaneth: "Swims-at-Night would have left it up to you. So what's it to be?" Swims-at-Night: "Look around you! That thing is unstable! If you use it, it might just kill you." Swims-at-Night: "Laaneth wouldn't have wanted this. But it's your call." Mecinar: "You think yourself my equal now? Pathetic. You cannot hope to match my genius!" Galyn: "You can barely contain the Heart's energy. Be careful, or it will destroy you — and this entire chamber! Mecinar: "No! Do you know what you've done?! Centuries of patience and planning — all lost! You will burn for this!" This page was last modified on 19 March 2019, at 19:08.